The Australian chemistry industry has been described as the ‘anchor’ of the modern economy. It is a critical enabler of almost every value chain in Australia, a key employer of Australia’s valuable STEM capability and a driver of innovation through advanced manufacturing. The products of chemistry are essential for our continued health, safety and quality of life. This is an important and strategic contribution. The industry has taken a proactive approach and developed the Strategic Industry Roadmap, to ensure it can continue this role in a complex and rapidly changing global and domestic marketplace. The Roadmap identifies barriers and key actions required for growth and investment, mapping out key industry priorities to form the foundation of the Assoication's work plan. The Roadmap is the result of extensive independent consultation and analysis, which led to two significant CSIRO reports: ‘Elements in Everything’ and ‘Strategic Directions’. The first, Elements in Everything, examines the Australian chemistry industry’s current profile and future trends. The second, Strategic Directions, discusses how the industry can achieve sustained growth by taking advantage of major global and domestic economic, social and environmental shifts known as Megatrends. Drawing on these independent reports, the Roadmap plots a course for the short, medium and longer term to achieve the industry’s vision and secure long-term benefits for Australia’s economy, society and environment. The Roadmap is a strategic plan that outlines how the industry can work with governments and other stakeholders to remove these roadblocks so that it can take advantage of opportunities, especially in Asia and the developing world, to achieve sustainable growth. At the heart of the document is the belief that Australia will benefit from a balanced economy that adds value to its resources through a healthy manufacturing sector in which the chemicals and plastics industry drives innovation and sustainable growth. 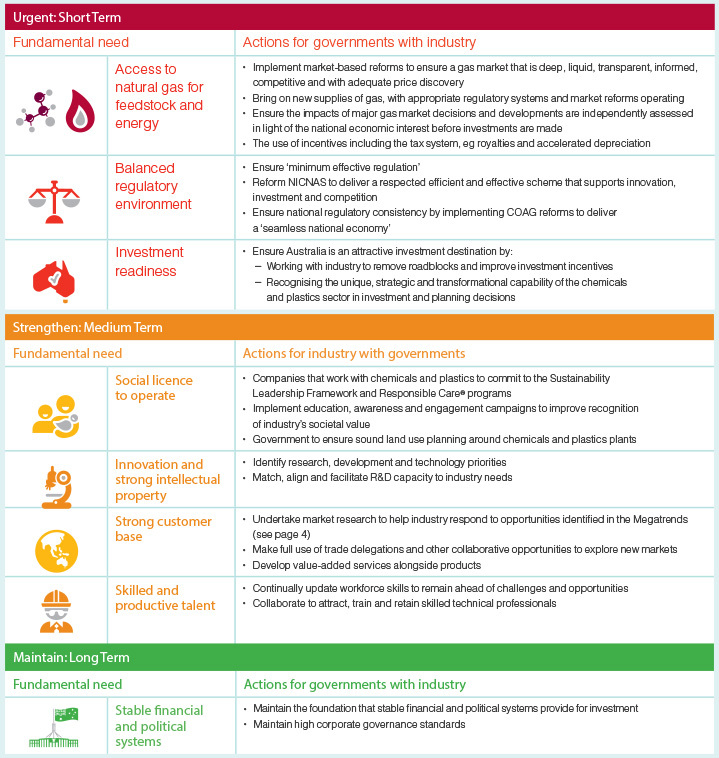 The industry has identified fundamental needs (key settings) that must be in place to put it on a path to sustainable growth. The Australian chemistry industry can help meet the demands of global and domestic growth while continuing to add significant value to the national economy, by enabling companies and supply chains to manufacture essential products and services. The industry welcomes the significant opportunities this Roadmap presents. The Roadmap was launched by Ross Pilling, BASF Managing Director at the industry's National Conference 2013. Chemistry Australia continues to evolve this strategy, with key actions the framework for the ongoing work-plan. Elements In Everything Elements in Everything is the first of three reports in the Strategic Industry Roadmap project. CSIRO conducted this independent study to look at the major trends likely to shape the Australian chemistry industry, and the policy responses required to meet those challenges. Strategic Directions 'Strategic Directions' is the sequel report to 'Elements in Everything'. It examines the technological advances, changing environmental regulations, shifting consumer preferences and societal trends that have the potential to open up new market growth areas for the chemicals and plastics industry.